Whether you need appliance repairs or maintenance in Vaughan, Ontario, we are here to provide the service. Our techs have the skills to service any home appliance. We are also up to date with innovative appliances and trained to utilize the most advanced repair techniques. At Appliance Repair Vaughan, we also install appliances. But when it comes to repair service needs, our job is to fix and prevent problems. And this is possible with routine or same day appliances service in Vaughan. Fridge trouble? Leaking washer? Problems with the dryer? 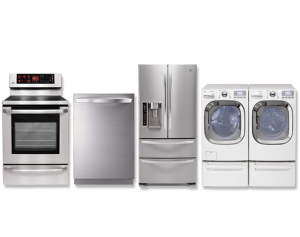 When you need appliance service in Vaughan, call us. Our team is your one stop shop. And that’s because we can serve your needs whether you want to fix, maintain, or install an appliance. What is included in our appliance repair service? The purpose of repairs is to fix a certain problem with a particular appliance. So our pros bring along replacement parts, diagnostic equipment, and tools. We start by troubleshooting to see which problems have caused the appliance to act up. Once we draw our conclusions, we take it from there. Our Vaughan appliances service might include adjustments, leveling the unit, or replacing parts. And we are prepared to do any repair work needed to ensure the appliance is back up and running. Our appliance service technician will also provide maintenance service. A simple problem with the door gasket of your refrigerator, oven, or washer will lead to energy loss and possibly water leak. Want to replace the dishwasher door gasket? Call us. We replace any part and respond quickly. Our job during routine appliances service is to find such damaged parts and replace them. Part of our job is to also fix problems and make sure there are no kinked hoses or rusty components. There is no doubt that appliances perform better and last longer when they are maintained. Our company can help you with such needs and will also be there to repair your appliances. With expertise in most brands and the skills to provide effective home appliance service in Vaughan, our company can be of assistance every time you deal with trouble either in the laundry room or kitchen. Call us for the best service in town.